Wanted to introduce myself. 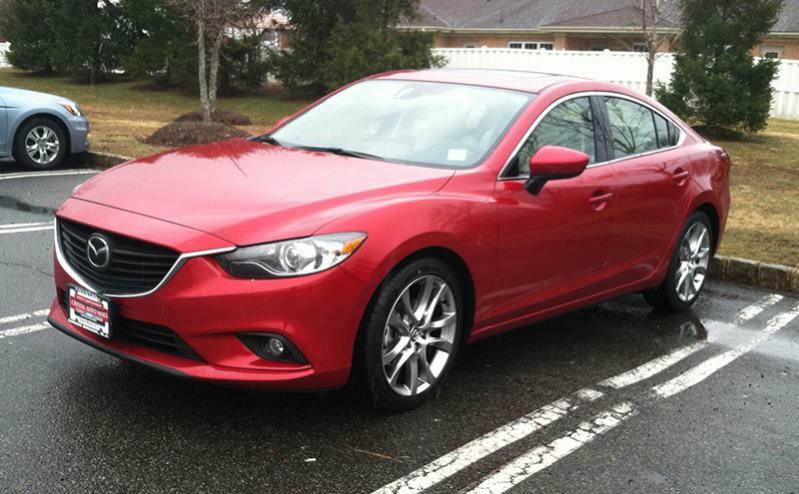 Just got myself a 2014 Mazda 6 GT with all the bells and whistles. I was able to get it for 31,000 OTD. This is my third Mazda and I'm pretty happy with this car. I got it on Saturday "Crystal Auto Mall" and now the car has about 600 miles. Story goes like this. I previously owned a 2010 Mazda 3s Hatchback. I loved that car. It was good to me and it never ever gave me a problem. Unfortunately due to my past jobs being so far the car took a lot of abuse. The harsh roads and the high mileage. The car had about 67k miles. I figured it was time for a new car. I had about 3 cars on the list and the Mazda 6 was not on it. The three cars were an "Acura TSX", "Lexus IS250", and a "CPO BMW 328". Test drove all the cars and they were all very nice. Somehow I wasn't happy with any of them. Beautiful cars though. Decided to visit my local Mazda dealer to see what they had in the showroom, and mind you I totally forgot the 6 was getting an overhaul. As soon as I pulled up at the dealer, there she was. A soul red GT 6. My mouth just dropped. Even my wife was impressed and she's not really a car person. Test drove it and a few hours later she was home with me. Interior is just gorgeous. I got the beige with black leather and wow. The technology in this car is just insane. I only wish the nav screen was a little bigger but It's all good. I can live with it. Love the Blind Spot monitoring system. It literally saved my a$$ twice. Kudos to that. The backup camera works really well. A car was barreling down the road and it warned me. Pretty cool. The gas is the best part. So far I'm getting around 32 miles on the gallon. That's a combo of local driving and highway. More highway of course. Of course there's a lot more to love so ask away!!! Nice choice! I as well have the SOUL RED with Almond interior. Nice to see someone else with the same configuration! Haha. That was me Paul. I was visiting my wife. She's a teacher in South Plainfield. Lol what are the odds! The red is nice. Didn't see that in person til I saw yours. All of the pics doesn't do the soul red justice. You HAVE to see the red in person. Lovely car, I was really considered the red 6 due to all of the advertisement. Did not pull the trigger due to the bad series of events I had back in 2000-2003 on my 2000 Celica GT (Red). Since the blue is underwhelming, I think my pick would be the red also. The silver is actually quite nice (dark tone), but we've already got 2 silver cars. I think if the tail lights can be smoked the red would look even better. Wonder if the police pay more attention to the red. At least that's the theory. Bad events maintaining the color? Or are you saying RED is just a sign of bad luck for you?